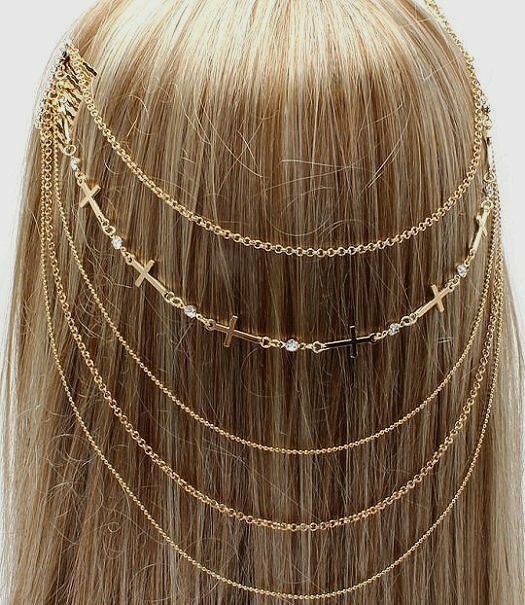 Multi Chains Head Chain/Hair Accessory. Crystal studded hair combs. Accented with draping chains, one which includes sideways crosses and alternating clear crystal studs. Two different style chains, small rolo links and tiny beaded style chains. Gold plated. Nickel and Lead Free. Will wrap well with bubble wrap for a safe transit. * Profits made from my listings will feed my parrots and macaws, including feeding and caring for my many rescued animals. Profits will also feed a colony of feral cats including getting them TNR'd. TNR stands for: TRAP - NEUTER *or spayed* - and RETURN. Thanks for stopping by! XO! !